Retinal vascular development in normal and OIR mice. The mouse is born with a largely avascular retina (A and B). During the first postnatal week, superficial retinal vessels grow radially from the optic nerve head (C). The deep retinal vasculature is established through branching of the superficial layer during the second week (D). A third intermediate plexus of vessels forms, and the mature retinal vasculature is established at around P30 (E and F). Exposure to hyperoxia causes central vaso-obliteration (G), and after returning to normoxia at P12, characteristic preretinal neovascular tufts form at the interface between the vascularized (peripheral) and avascular (central) retina (H). 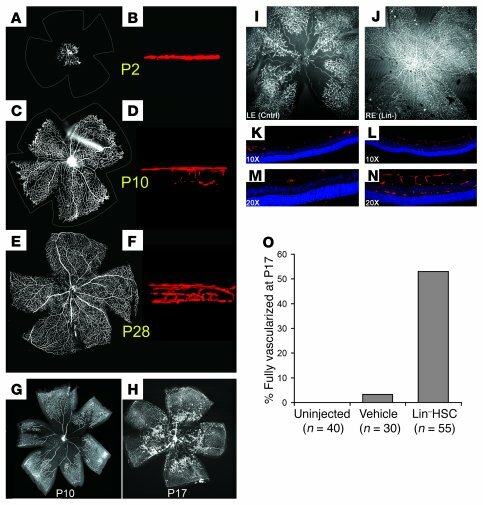 (I–N) Lin–HSCs promote vascular repair in the OIR model. Lin–HSC injected intravitreally prior to oxygen exposure dramatically accelerated revascularization compared with the vehicle-treated fellow eye at P17. While retinas treated with vehicle showed partial absence of the superficial vasculature (I) and complete absence of the deep retinal vasculature (K and M), the Lin–HSC-treated eye showed relatively normal retinal vasculature (J, L, and N). (O) A dramatically higher proportion of eyes treated with Lin–HSC were fully revascularized at P17 compared with control eyes. Vessels were visualized by cardiac perfusion of fluorescein-dextran in A–F, I, and J (B, D, and F are images taken from 3D renderings rotated 90 degrees), and by GS lectin in G, H, and K–N. Nuclei in K–N were labeled with DAPI (blue). RE, right eye; LE, left eye. Magnification, ×4 (A, C, E, G, and H), ×10 (I and J), ×60 (B, D, and F).